Despite their relevance to mucosal defense, production of IgA and the function of lung B-cells remain unknown in chronic obstructive pulmonary disease (COPD). We assessed IgA synthesis in the lungs of COPD (n=28) and control (n=21) patients, and regulation of B-cells co-cultured with in vitro-reconstituted airway epithelium. In COPD lung tissue, synthesis of IgA1 was increased, which led to its accumulation in subepithelial areas. In vitro, the COPD bronchial epithelium imprinted normal human B-cells for increased production of IgA (mainly IgA1) and maturation into CD38+ plasma cells. These effects were associated with upregulation of TACI (transmembrane activator and CAML interactor) and were observed under resting conditions, while being partly inhibited upon stimulation with cigarette smoke extract. Interleukin (IL)-6 and BAFF (B-cell activating factor)/APRIL (a proliferation-inducing ligand) were upregulated in the COPD epithelium and lung tissue, respectively; the IgA-promoting effect of the COPD bronchial epithelium was inhibited by targeting IL-6 and, to a lower extent, by blocking TACI. These data show that in COPD, the bronchial epithelium imprints B-cells with signals promoting maturation into IgA-producing plasma cells through the action of two epithelial/B-cell axes, namely the IL-6/IL-6 receptor and BAFF-APRIL/TACI pathways, while cigarette smoke partly counteracts this IgA-promoting effect. Chronic obstructive pulmonary disease (COPD) represents a major health burden worldwide with increasing morbidity and mortality. It is a complex lung disorder associated with aberrant immune and structural responses of the airways to repeated exposure to inhaled toxins, usually cigarette smoke. It has been suggested that chronic obstructive lung diseases may originally result from aberrant programming of the airway epithelium . IgA is a major first-line defence mechanism at mucosal surfaces, including the airways. It is produced as dimeric IgA (dIgA), which is able to bind to the polymeric immunoglobulin receptor (pIgR) that translocates dIgA from the basolateral to the apical pole of epithelial cells. We previously showed that patients with severe COPD display decreased bronchial pIgR expression , and this defect correlated with disease severity and neutrophilic inflammation [3, 4]. It was also shown that this impaired transport of IgA could not only result in impaired mucosal immunity but also in the formation of immune complexes in subepithelial tissues . 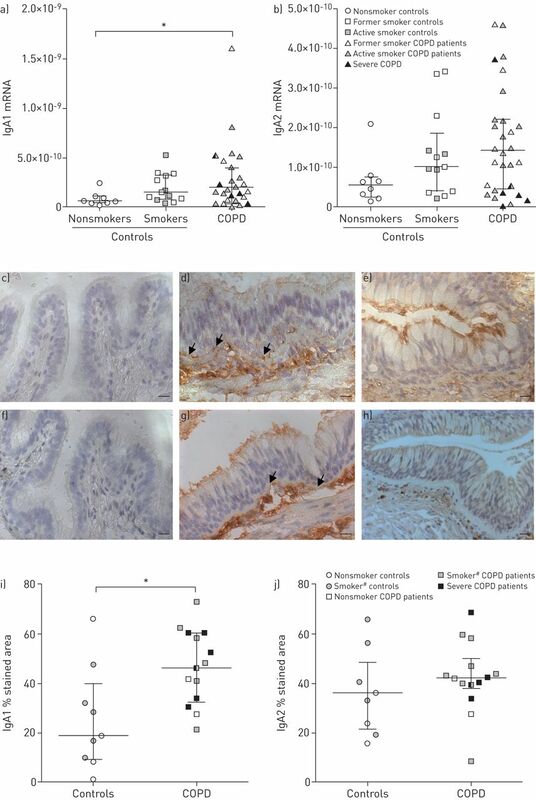 Both inflammatory and structural components underlie the development of COPD in susceptible smokers; these include accumulation of neutrophils, macrophages and CD8+ T-cells [6, 7], as well as peribronchial fibrosis and epithelial changes. More recently, peribronchial lymphoid follicles have been described in COPD , with B-cell follicles in both proximal and distal airways, particularly in patients with severe disease and emphysema [9, 10]. These follicles consist of a specific arrangement of B-cells, T-cells, dendritic cells and follicular dendritic cells [11, 12]. It has been suggested that dendritic cells, numbers of which are increased in COPD small airways, play an important role in the formation of peribronchial lymphoid follicles in this disease [13–15]. B-cells are also key players in adaptive immunity, acting not only as immunoglobulin-producing but also as antigen-presenting cells. Moreover, B-cells represent a bridge between innate and adaptive immunity, as they are able to switch and produce immunoglobulins through both T-dependent and T-independent pathways. Despite this evidence, it remains unknown whether B-cell function, particularly IgA production, is altered in COPD. Class-switch recombination for IgA was thought to be mostly CD40-dependent, but more recent studies have identified innate pathways involving cytokines mainly released by epithelial cells regulating IgA1 and IgA2 production independently of T-cells . TACI (transmembrane activator and CAML interactor) interacts with two members of the tumour necrosis factor family, namely BAFF (B-cell activating factor) and APRIL (a proliferation-inducing ligand), and plays a major role in the class switch to IgA [17, 18]. Thus, it was shown that thymic stromal lymphopoietin produced by intestinal epithelial cells induces BAFF release by dendritic cells . APRIL [20, 21], the other ligand of TACI , may induce T-cell/CD40-independent production of IgA [23, 24], favouring IgA2 subclass switching . The aim of this study was to explore, through an integrated approach using lung tissue and in vitro-reconstituted primary bronchial epithelium, whether the epithelial/B-cell interactions underlying IgA synthesis are altered in patients with COPD, hypothesising that the epithelium could be impaired in conditioning B-cells to produce IgA. As COPD is a smoke-related disease often characterised by bacterial infections, we assessed the regulation of B-cells by the bronchial epithelium both under resting conditions and upon epithelial stimulation by lipopolysaccharide (LPS) or cigarette-smoke extract (CSE). 49 patients (28 with COPD and 21 controls) undergoing lung resection surgery for a solitary tumour were included in the study (table 1). Primary airway epithelial cells (AECs) were derived from proximal specimens of lung tissue from 28 patients with or without COPD (table E1). AECs were cultured under polarised, air–liquid interface (ALI) conditions to reconstitute a pseudostratified mucociliary epithelium . CD19+ B-cells were freshly purified by immunomagnetic sorting (MACS; Miltenyi Biotec, Bergisch Gladbach, Germany) from healthy blood donors' peripheral blood mononuclear cells [26, 27] and co-cultured (0.5×106 per well) with AECs in the basolateral compartment for 13 days (to allow potential B-cell maturation and differentiation into plasma cells). CSE was prepared freshly with Kentucky 2R4F research-reference cigarettes (College of Agriculture Reference Cigarette Program, University of Kentucky, Lexington, KY, USA). Smoke from three cigarettes was bubbled through 10 mL PBS (referred to as 100% CSE) with a Pump Drive 5006 (Heidolph, Schwabach, Germany) at 50 cycles per minute. Cells were then stimulated either with LPS (1 µg·mL−1) or CSE (5%) during the first 2 days of co-culture. Immunoglobulin synthesis was assessed using goat anti-human (h)IgA polyclonal antibody (ACP17, made in our laboratory) or mouse anti-hIgG monoclonal antibody (mAb) (I5885; Sigma, St Louis, MO, USA) as capture antibodies. Horseradish peroxidase-conjugated antibodies were used for detection (goat anti-hIgA A0295 (Sigma) and rabbit anti-hIgG (6145-05; Southern Biotech, Birmingham, AL, USA)). For IgA1 and IgA2 detection, mouse mAbs B3506 or A9604 were used, respectively, followed by sheep anti-mouse (m)IgG–horseradish peroxidase conjugate A6782 (Sigma). Transforming growth factor (TGF)-β1, BAFF and APRIL levels were determined by ELISA (R&D Systems, Abingdon, UK) according to the manufacturer's instructions. Interleukin (IL)-6 activity in the culture supernatants was measured using an IL-6-dependent hybridoma clone (7TD1), as previously described . 1 U·mL−1 IL-6 was defined as the concentration leading to the half-maximal growth of 7TD1 cells. The following anti-human mAbs were used: fluorescein isothiocyanate-conjugated CD19 and CD38 mAbs, and isotype-matched control IgG (BD Pharmingen, San Jose, CA, USA); and allophycocyanin (APC)/Cy7 conjugated CD27 and BAFF receptor (BAFF-R) mAbs, phycoerythrin-conjugated TACI mAb, and APC/Cy7-conjugated, isotype-matched control IgG (BioLegend, San Diego, CA, USA). Cells (1–2×105) were saturated with FcR-Blocking (Miltenyi Biotec) for 15 min then incubated with fluorochrome-labelled antibodies for 40 min and fixed with 1.25% paraformaldehyde. Flow cytometry was performed using FACSCantoII cytometer equipped with DIVA-software (BD Biosciences, San Jose, CA, USA). CD19+ B-cells were co-cultured (1×106 per well) with AECs from COPD patients in the basolateral compartment for 13 days. TACI-Fc, control IgG-Fc (R&D Systems), murine anti-hIL-6 (from the laboratory of J. Van Snick) and control mIgG (eBioscience, Hatfield, UK) were added at 5 µg·mL−1 to B-cells alone or in co-culture. Culture supernatants were harvested at different time points (2, 6, 8 and 13 days) to measure the production of IgA, the neutralising reagents being added at these different time-points during medium replacement. Expression levels of TACI, BAFF and APRIL were quantified by real-time quantitative (q)PCR using the iCycler IQ5 PCR thermocycler (Bio-Rad, Hercules, CA, USA), and normalised to those of the RPS18 (ribosomal protein S18) housekeeping gene. Expression levels of IgA1 and IgA2 were determined by qPCR using an ABI-PRISM-7900 Sequence Detection System thermal cycler (Applied Biosystems, Foster City, CA, USA), and normalised to those of RPS18. Primary antibodies were used as for IgA1 and IgA2 ELISA followed by secondary biotinylated anti-mIgG (B8520; Sigma). The slides (one to three different slides per patient) were scanned using the Slide Scanner SCN400 and subepithelial staining was quantified with the TissueIA software (Leica Microsystems, Wetzlar, Germany). Differences between groups were analysed using nonparametric tests, either the Mann–Whitney U-test or Kruskal–Wallis test, or Wilcoxon or Friedman test when indicated. Correlation coefficients were calculated using Spearman's rank method. A p-value <0.05 was considered statistically significant. Statistical analyses were performed using Prism (version 5.00 for Windows; GraphPad, San Diego, CA, USA). All patients provided signed informed consent for the study protocol, which was approved by our local ethical committee (ref. #2007/19MARS/58, including extension for blood samples). Lung tissue was obtained from well-characterised COPD patients (n=28) with various ranges of severity of airflow limitation, compared with smokers and nonsmokers without the disease (i.e. with normal lung function) (n=21) (table 1). Bronchial epithelium was reconstituted in vitro from the proximal lung tissue of 28 of these patients with or without COPD (n=14 for each group) (table E1). We wondered whether expression of IgA was affected in COPD, and performed qPCR to quantify IgA1 and IgA2 mRNA in lung tissue from patients with or without COPD. 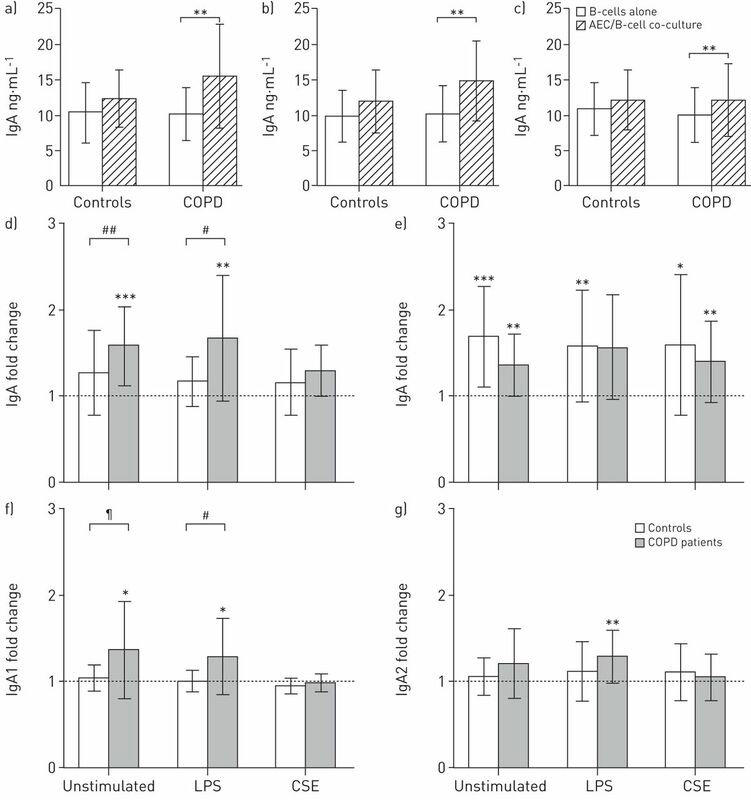 Figure 1a and b shows that synthesis of IgA1 increased in COPD, while no significant increase was observed for IgA2 (p=0.02 for IgA1 and p=0.06 for IgA2 mRNA levels in lung tissue of COPD, compared with control non-smokers, whereas no significant difference was observed between control smokers and COPD patients). Evaluation of IgA expression and subepithelial IgA accumulation in lung tissue. Expression of a) IgA1 and b) IgA2 mRNA normalised to the housekeeping gene RPS18 ribosomal protein S18) in lung tissue (median with interquartile range). Among controls, white circles represent never smokers; white squares represent ex-smokers while grey squares represent active smokers. Representative c–e) IgA1 and f–h) IgA2 staining in lung tissue from patients without (c and f) or (d and g) with COPD. e and h) control IgG. Scale bars=20 µm. Arrow: subepithelial accumulation of IgA1 or IgA2. Percentage of subepithelial staining of i) IgA1 and j) IgA2 in lung tissue of patients with or without chronic obstructive pulmonary disease (COPD) median with interquartile range). #: including former smokers. *: p<0.05. We then assessed IgA protein content in lung tissue (fig. 1c–j). Immunostaining for IgA1 and IgA2 demonstrated intraepithelial (mainly apical) staining, while in COPD patients, a basolateral accumulation of IgA was observed (p=0.02 for IgA1 subepithelial staining in controls versus COPD patients). The effect of the bronchial epithelium from COPD patients on B-cell IgA synthesis was studied in 13-day co-culture (to allow potential B-cell maturation and differentiation into plasma cells) of normal blood CD19+ B-cells with ALI-AECs (figs S1-A and 2). Summary of the experimental design to reconstitute the bronchial epithelium in vitro, co-cultured with freshly purified B-cells. COPD: chronic obstructive pulmonary disease; ALI: air–liquid interface; PBMC: peripheral blood mononuclear cell; MACS: immunomagnetic sorting; AEC: airway epithelial cell. IgA production by B-cells was assessed following co-culture with AECs from COPD patients versus controls, and compared with IgG production. Mean ± sd concentrations were 9.7 ± 5.0 ng·mL−1 IgA (8.6 ± 5.0 ng·mL−1 IgA1 and 2.8 ± 1.6 ng·mL−1 IgA2) and 5.5 ± 3.6 ng·mL−1 IgG. Figure 3a–c shows the IgA production levels in B-cells cultured until day 13, alone or co-cultured with AECs, either from controls or COPD patients. As the immunoglobulin production levels differed according to B-cell donor, in order to compare the intrinsic effect of AECs on B-cell immunoglobulin production, data were expressed as fold changes in IgA production (as well as of IgG, IgA1 and IgA2) following normalisation to B-cells alone (fig. 3d–g). Effect of AEC/B-cell co-culture on Ig production. Ig production was assessed by ELISA after 13 days of culture of B-cells alone or in co-culture with AECs. IgA production levels in B-cells cultured alone or co-cultured with AECs from controls or chronic obstructive pulmonary disease (COPD) patients, a) not stimulated, or stimulated with b) lipopolysaccharide (LPS) or c) cigarette-smoke extract (CSE), are shown. Fold change of d) IgA, e) IgG, f) IgA1 g) and IgA2 production by B-cells co-cultured with AECs corrected for results obtained in B-cells cultured alone. Data represent the mean±sd of 14 experiments performed with AECs from control patients versus 14 experiments with AECs from COPD patients. *: p<0.05 (co-culture versus B-cells alone); **: p<0.01 (co-culture versus B-cells alone); ***: p<0.001 (co-culture versus B-cells alone); #: p<0.05 (COPD versus controls); ##: p<0.01 (COPD versus controls); ¶: p=0.05 (COPD versus controls). IgG production was up-regulated (∼1.5-fold) in B-cells co-cultured with AECs compared with B-cells alone. This increase was observed regardless of the AEC phenotype or of the culture conditions (resting, LPS or CSE stimulation). In contrast, IgA production was increased in B-cells co-cultured with AECs from COPD patients but not with those from controls (1.58- versus 1.26-fold increase under resting conditions and 1.67- versus 1.16-fold increase upon LPS stimulation, p=0.0035 and p=0.0392, respectively). When COPD patients were divided into two groups of severity (mild/moderate versus severe/very severe), it appeared that IgA upregulation was more significant in the severe/very severe group (fig. S1-B). In addition, this IgA-upregulating effect was observed in COPD irrespective of active or former smoking status (fig. S1-C). Upon CSE stimulation, the upregulating effect on IgA was partially abrogated (1.28- versus 1.15-fold change in B-cells co-cultured with AECs from COPD patients and control patients, respectively; p=0.2064). Notably, LPS and CSE did not directly affect immunoglobulin production by B-cells (fig. S2–A). To exclude an effect of the human leukocyte antigen mismatch between epithelial and B-cells, AECs from COPD patients and controls were co-cultured with B-cells from the same donors. Data shown in table 2 confirmed that IgA upregulation was observed with AECs from COPD and not significantly with AECs from controls. To explore the mechanisms by which AECs from COPD patients induced a selective induction of IgA synthesis, we assessed expression of the differentiation marker CD38 and the receptors BAFF-R and TACI (which bind BAFF only, and both BAFF and APRIL, respectively). CD38 was upregulated (∼2-fold) on B-cells co-cultured with AECs from COPD patients (and not those co-cultured with AECs from controls) compared with B-cells cultured alone (p=0.0067) (fig. 4a and b). Whereas LPS stimulation had no effect, CSE stimulation suppressed the capacity of AEC to induce CD38+ plasma cells (fig. S3-A). 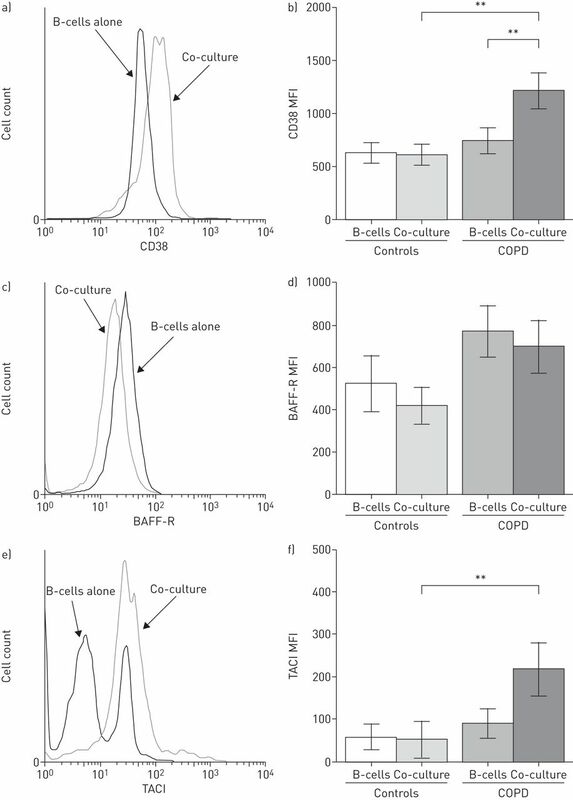 In contrast to BAFF-R, which was not affected by the co-culture (except a mild inhibition upon CSE stimulation), TACI was induced in B-cells co-cultured with AECs from COPD patients (∼3-fold) compared with B-cells co-cultured with control AECs (p=0.0071) (fig. 4c–f). Both LPS and CSE stimulation dampened this effect (fig. S3-C), even though CSE per se could upregulate TACI on B-cells (fig. S2–B). In contrast, LPS and CSE did not affect CD38 or BAFF-R expression levels (fig. S2–B). Effect of airway epithelial cell (AEC)/B-cell co-culture on IgA-related markers. a, c and e) Flow cytometry date and b, d and f) expression levels of the differentiation marker CD38 (a and b), and the receptors BAFF (B-cell activating factor) receptor (BAFF-R) (c and d) and TACI (transmembrane activator and CAML interactor) (e and f) (which bind BAFF only, and both BAFF and APRIL (a proliferation-inducing ligand), respectively) on B-cells cultured alone or co-cultured with AECs. Data are presented as mean fluorescence intensity (MFI) minus the MFI of the isotype control antibody, as the mean±sd of 13 experiments performed with AECs from control patients versus 14 experiments with AECs from COPD patients. **: p<0.01. To further explore the mechanisms by which AECs from COPD patients induced a selective induction of IgA synthesis, we looked at the IgA-inducing cytokines TGF-β1, APRIL, BAFF and IL-6. No significant changes were observed for TGF-β1 (“total”, following acidification), APRIL and BAFF (except a slightly reduced BAFF in AECs from COPD patients compared with controls, p=0.02) (figs 5a–c and S4). In contrast, AECs from COPD patients released increased amounts of IL-6 compared with AECs from controls, and this reached significance upon CSE stimulation (p=0.0435) (fig. 5d–f). Effect of airway epithelial cell (AEC)/B-cell co-culture on IgA-inducing factors. Production of a) transforming growth factor (TGF)-β1, b) APRIL (a proliferation-inducing ligand) and c) BAFF (B-cell activating factor) by AECs cultured alone or in co-culture with B-cells under unstimulated conditions, and bioactive interleukin (IL)-6 in d) resting, and e) lipopolysaccharide- or f) cigarette-smoke extract-stimulated cells. Data are presented as median (interquartile range) of 9–14 experiments performed with AECs from control patients versus 10–14 experiments with AECs from chronic obstructive pulmonary disease (COPD) patients. *: p<0.05; #: p=0.05. As TACI was a candidate mediator of IgA upregulation by the COPD epithelium (through BAFF and/or APRIL), we further investigated the expression of these molecules in lung tissue. No significant difference was observed between groups in TACI mRNA levels (p=0.13 and p=0.19 for nonsmokers compared with smokers and COPD patients, respectively) (fig. 6a). However, expression levels of TACI and IgA1 mRNA were significantly correlated (rs=0.44, p=0.0012) (fig. 6b). Notably, this correlation remained significant (rs=0.42, p=0.0027) when one outlying value was excluded. Moreover, BAFF and APRIL mRNA levels were upregulated in smokers and COPD patients compared with nonsmokers (p=0.0470 and p=0.0578 for BAFF and p=0.0089 and p=0.0141 for APRIL, respectively) (fig. 6c and d). In addition, BAFF levels strongly correlated with those of TACI and APRIL (rs=0.50, p=0.0002) and rs=0.75 (p<0.0001), respectively) (fig. S5). Evaluation of TACI (transmembrane activator and CAML interactor) expression and its ligands BAFF (B-cell activating factor) and APRIL (a proliferation-inducing ligand) in lung tissue. a) Expression of TACI mRNA normalised to that of the housekeeping gene RPS18 (ribosomal protein S18) in lung tissue (median with interquartile range) and b) correlation with IgA1 expression levels. Expression of c) BAFF and d) APRIL mRNA normalised to RPS18 in lung tissue of the same patients (median with interquartile range). *: p<0.05; **: p<0.01; #: p=0.05. Based on our data, both TACI and IL-6 represented candidates to mediate the upregulation of IgA synthesis induced by the COPD epithelium; we then investigated their contribution to IgA induction by using TACI-Fc and anti-IL-6 blocking antibodies. The neutralisation of IL-6 significantly decreased IgA production by B-cells in co-culture with AECs (fig. 7a and b). This effect was significant at all time-points but was more pronounced at the early phase of co-culture. Blockade of TACI also inhibited, to a lesser extent, the induction of IgA production (fig. 7c and d). 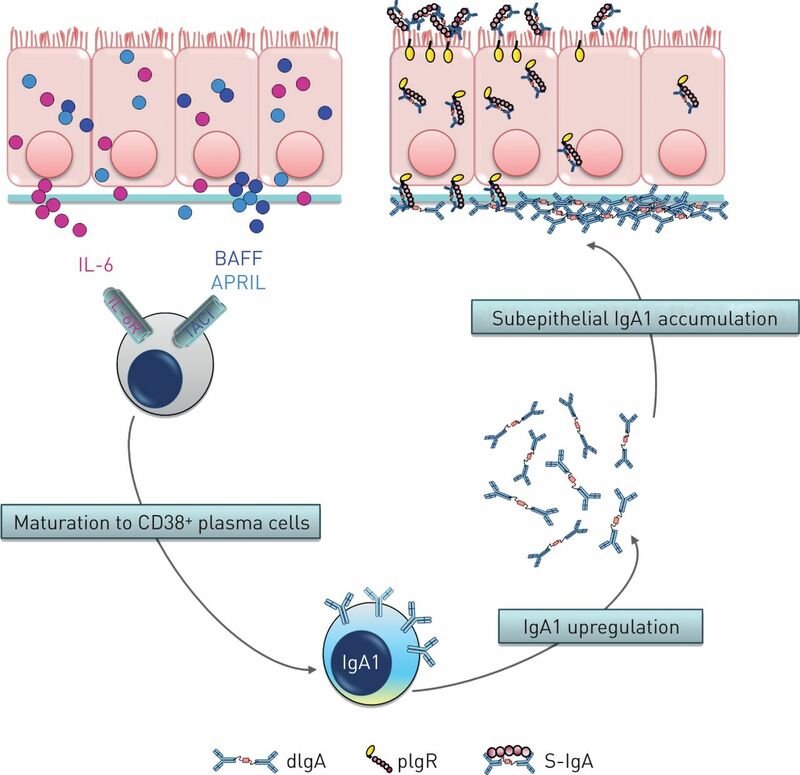 These latter data further support the concept that the COPD epithelium induces B-cell IgA upregulation via IL-6/IL-6 receptor (IL-6R) and BAFF-APRIL/TACI pathways; a schematic view of the mechanisms operating between the mucosal epithelium and B-cells, and regulating the IgA system is shown in figure 8. Effect of targeting BAFF (B-cell activating factor)/APRIL (a proliferation-inducing ligand) or interleukin (IL)-6 on IgA production. Effect of a and b) IL-6 blocking antibody (5 µg·mL−1) and c and d) TACI (transmembrane activator and CAML interactor) Fc (5 µg·mL−1) on IgA production. a and c) IgA production by B-cells co-cultured with airway epithelial cells (AECs) (expressed as fold change) in the presence of blocking agents (or their respective negative controls), as corrected for those obtained in B-cells co-cultured with untreated AECs. b and d) absolute IgA values on day 8. Culture supernatants were harvested at different time points (2, 6, 8 and 13 days) to measure the production of IgA, the neutralising reagents being added at these different time points during medium replacement. Data represent mean ± sd of three experiments. mIgG: mouse IgG; Ab: antibody. *: p<0.05; **: p<0.01. Schematic cartoon of the mechanisms of regulation of IgA production by the chronic obstructive pulmonary disease (COPD) airway epithelium. The COPD epithelium induces B-cell maturation to IgA-producing CD38+ plasma cells via the IL-6/IL-6 receptor (IL-6R) and BAFF-APRIL/TACI pathways. IgA accumulation in subepithelial areas of COPD airways is probably due to the conjunction of increased IgA production and the previously documented polymeric immunoglobulin receptor (pIgR) downregulation . dIgA: dimeric IgA; S-IgA: secretory IgA. This study shows that the bronchial epithelium regulates B-cells and humoral immunity in the lung, showing that the COPD epithelium imprints B-cells with increased IgA production and maturation into plasma cells. IL-6 is critical to IgA upregulation upon epithelial conditioning, and is produced in increased amounts by the bronchial epithelium of COPD patients. The BAFF-APRIL/TACI pathway is also upregulated in lung tissue from COPD patients and smokers, and contributes, to a lesser extent, to this epithelial/B-cell/IgA axis. However, we also show that IgA accumulates in subepithelial areas, suggesting that increased synthesis does not translate into increased secretory IgA. In addition, exposure of the bronchial epithelium to CSE counteracts its IgA-promoting activity in vitro. A key finding of our study is that a crosstalk exists in the lung between the bronchial epithelium and B-cells. The bronchial epithelium reconstituted in vitro from the lung tissue of COPD patients was able, when co-cultured with blood B-cells from normal donors, to promote IgA production, in contrast to IgG, which was induced irrespectively of the patient's phenotype. This finding was corroborated by expression data in lung tissue, where active synthesis of IgA (particularly IgA1) is increased in COPD. This is in contrast to findings in the gut, where a preferential IgA2 synthesis is observed [21, 24], but it remains to be determined whether upregulation of IgA synthesis in the COPD lung relates to switching to IgA and/or activation or proliferation of IgA-switched B/plasma cells. Both maturation of B-cells into CD38+ immunoglobulin-secreting plasma cells and TACI expression increased following co-culture with epithelium from COPD patients. In addition, TACI correlated with IgA1 synthesis in COPD lung tissue, and its neutralisation slightly but significantly reduced IgA synthesis in epithelial/B-cell co-cultures. Previous studies showed that both TACI and BAFF-R could mediate IgA switching in B-cells [18, 22]. In the lung, both epithelial and dendritic cells deliver IgA-inducing signals to B-cells , such as BAFF and APRIL, which contribute in a Toll-like receptor-dependent manner to local accumulation and activation (e.g. for immunoglobulin synthesis) of airway B-cells . The reason for decreased BAFF production observed in our AEC cultures from COPD patients remains elusive. A negative feedback-loop effect of upregulated TACI on BAFF-producing cells could be speculated, as TACI may indirectly regulate BAFF levels, which are notably elevated in TACI−/− mice [31, 32]. In contrast, BAFF production was increased in lung tissue from our smokers and COPD patients, as previously reported . We show that APRIL is also upregulated in smokers and COPD patients. Among IgA-inducing factors, IL-6 was upregulated in primary cultures of AECs from COPD patients. Increased expression of IL-6 has been reported in COPD [34, 35], and is known to increase IgA production  and to mediate the pro-IgA effect of gut dendritic cells . Interestingly, the blockade of IL-6 significantly suppressed IgA induction by COPD epithelial cells. It was reported that deletion of IL-6 attenuated lung inflammation and fibrosis in a murine model of adenosine-mediated injury , and that a genetic polymorphism (IL6 −174G/C) was associated with susceptibility to COPD . Moreover, it was reported that IL-6 concentration is increased in the peripheral blood of COPD patients, and represents a reliable marker of systemic inflammation discriminating between COPD patients and smokers without COPD [40, 41]. Our data indicate that IL-6 mediates the priming effect of the COPD bronchial epithelium on B-cells for IgA synthesis. However, it remains to be determined whether IL-6 is also involved in the differentiation/maturation of B-cells in the COPD lung, and whether the regulation of B-cells from COPD patients could differ from that of the normal blood B-cells used here. Thus, it was found that blood B-cells from actively smoking COPD patients could differ from healthy controls in terms of B-cell responses and immunoglobulin switching . It is therefore possible that intrinsic changes could also directly affect B-cells from smokers and/or COPD patients, in addition to their abnormal conditioning by the airway epithelium, which was the focus of the present study. Our data suggest that increased synthesis of IgA in the lung of COPD patients does not translate into increased secretory levels, as a clear accumulation of IgA in subepithelial areas was observed. This observation is probably related to reduced pIgR-mediated transport of IgA across the epithelium, which has been reported in COPD [2, 5], and may abort IgA trafficking across the respiratory mucosa and limit its role for so-called immune exclusion of inhaled pathogens. In addition, although in vitro exposure of the epithelium to cigarette smoke could upregulate IL-6 release and TACI expression, it counteracted the IgA-promoting effect of the epithelium on B cells. The effects of cigarette smoking on the lung IgA system include multiple components. In our in vitro co-culture system, the exposure of COPD bronchoepithelial cells to CSE reduced their IgA-upregulating effect on B-cells. In contrast, IgA1 expression was upregulated in situ in lung biopsies from COPD patients. Moreover, the IgA-inducing factors BAFF and APRIL were upregulated in lung biopsies of COPD patients, as well as from “healthy” smokers, as compared with nonsmokers. These results suggest that IgA production by B-cells is promoted in the lungs of smokers and COPD patients, following repeated/chronic smoke exposure, whereas “acute” exposure of the airway epithelium from COPD downregulates its capacity to stimulate IgA production. However, interpretation of data obtained in vitro and in situ needs caution. First, in our in vitro system, AECs were exposed once and for a limited duration (48 h); it remains to be determined whether a repeated or prolonged exposure could drive different responses. Second, IgA responses were studied in vitro in co-cultures of AECs and B-cells, while other players (e.g. dendritic cells) could be involved [14, 15]. Third, the presence of lymphoid follicles in the COPD lung  could also, in turn, modify B-cell/immunoglobulin responses to smoke exposure. It is also well known that serum levels of IgA, IgG and IgM are reduced in smokers, in contrast to those of IgE . In addition, cigarette smoke represents an important risk factor for infection by, and exacerbates the lung inflammatory response to, Haemophilus influenzae (the most frequently isolated bacterial agent during COPD exacerbations) . We suggest that these features, at least in part, result from smoke-induced alterations in the mechanisms promoting lung IgA immunity. Altogether, our findings show that, besides impaired transepithelial transport of IgA , the COPD bronchial epithelium imprints B-cells for increased IgA production and maturation into (CD38+) plasma cells. We identified that, in vitro, the epithelial IL-6/B-cell axis plays a central role in promoting IgA synthesis as well as, to a lower extent, the BAFF-APRIL/TACI axis. However, our data in lung tissue show that the activation of these IgA-promoting pathways does not lead to increased protection of the lung through IgA, as it accumulates in subepithelial areas, presumably due to concomitant impaired transepithelial transport. In addition, cigarette smoke may partly counteract IgA-promoting pathways by directly acting on the epithelium, which potentially accounts for increased susceptibility of active smokers with COPD to respiratory infections. Thus, this study highlights a crosstalk between the epithelium and B-cells, regulating IgA production in COPD, as well as the need for the identification of the mechanisms of impaired transport of IgA across the epithelium before defining strategies to restore normal lung IgA immunity. The authors thank: P. Thurion and M. Delos (Pathology Dept, CHU Mont-Godinne, Yvoir, Belgium), and C. Fregimilicka and C. Bouzin (cell imaging platform of IREC, UCL, Brussels, Belgium) for their help with tissue processing and immunohistochemistry; the thoracic surgery departments of the Cliniques universitaires St Luc, Brussels (A. Poncelet) and of CHU Mont-Godinne, Yvoir (P. Eucher); A. Robert (Institut de Recherche Santé et Société, Pôle d'épidémiologie et biostatistique, UCL) for help with statistical analysis; Y. Sibille (Pulmonary Dept, CHU Mont-Godinne) for advice and critical review of the manuscript; and P. Cheou (C. de Duve Institute of Cellular Pathology and Ludwig Institute for Cancer Research, UCL) for help with IL-6 bioassay. Support statement: Maha Zohra Ladjemi was recipient of a European Respiratory Society/Marie Curie Joint Postdoctoral Research Fellowship (grant MC1592-2010) and a Seventh Framework Programme 2007–2013 grant (agreement RESPIRE, PCOFUND-GA-2008-229571). Charles Pilette is postdoctoral specialist of the Fonds National de la Recherche Scientifique, Belgium (grant FRSM 3.4522.12 and mandate #1.R.016.14) and investigator of WELBIO (CR-2012S-05).
. Epithelium dysfunction in asthma. J Allergy Clin Immunol 2007; 120: 1233–1244. Reduced epithelial expression of secretory component in small airways correlates with airflow obstruction in chronic obstructive pulmonary disease. Am J Respir Crit Care Med 2001; 163: 185–194. Secretory component is cleaved by neutrophil serine proteinases but its epithelial production is increased by neutrophils through NF-κB- and p38 mitogen-activated protein kinase-dependent mechanisms. Am J Respir Cell Mol Biol 2003; 28: 485–498. Increased galectin-3 expression and intra-epithelial neutrophils in small airways in severe COPD. Eur Respir J 2007; 29: 914–922. Bronchial secretory immunoglobulin a deficiency correlates with airway inflammation and progression of chronic obstructive pulmonary disease. Am J Respir Crit Care Med 2011; 184: 317–327.
. Chronic obstructive pulmonary disease. Inflammation of small airways and lung parenchyma. Am J Respir Crit Care Med 1999; 160: Suppl., S21–S25. Increased number of B-cells in bronchial biopsies in COPD. Eur Respir J 2006; 27: 60–64. Cigarette smoke-induced emphysema: a role for the B cell? Am J Respir Crit Care Med 2006; 173: 751–758.
. Lymphoid follicles in chronic lung diseases. Thorax 2013; 68: 597–598. Lymphoid follicles in very) severe COPD: beneficial or harmful? Eur Respir J 2009; 34: 219–230. Van Pottelberge G, et al. 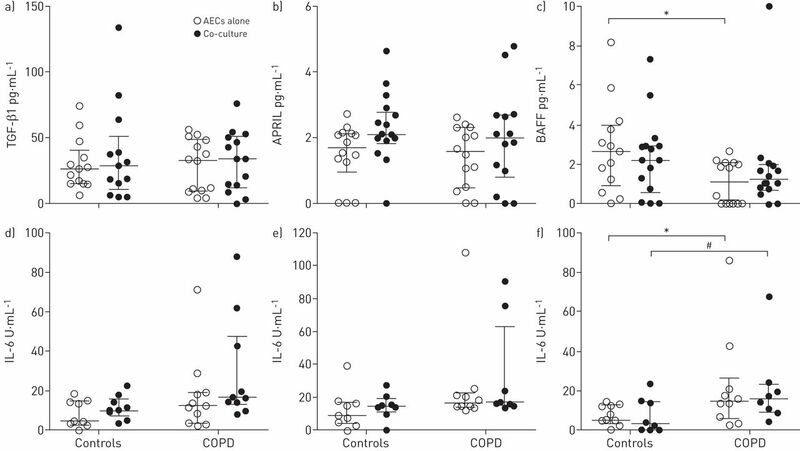 Accumulation of dendritic cells and increased CCL20 levels in the airways of patients with chronic obstructive pulmonary disease. Am J Respir Crit Care Med 2007; 175: 998–1005. 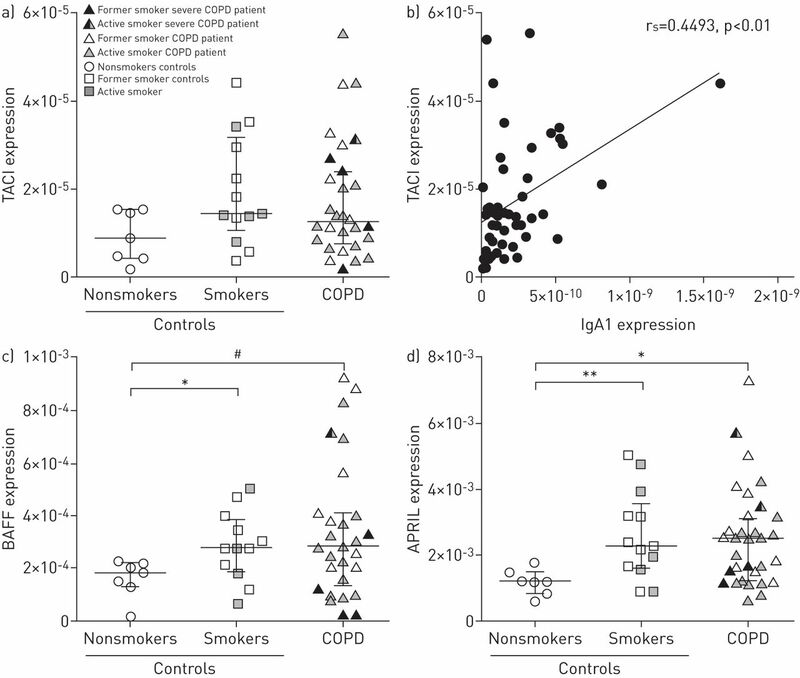 Impact of smoking on dendritic cell phenotypes in the airway lumen of patients with COPD. Respir Res 2014; 15: 48.
. The regulation of IgA class switching. Nat Rev Immunol 2008; 8: 421–434. Tumor necrosis factor TNF) receptor superfamily member TACI is a high affinity receptor for TNF family members APRIL and BLyS. J Biol Chem 2000; 275: 35478–35485. TACI regulates IgA production by APRIL in collaboration with HSPG. Blood 2007; 109: 2961–2967. Epithelial cells trigger frontline immunoglobulin class switching through a pathway regulated by the inhibitor SLPI. Nat Immunol 2007; 8: 294–303. Impaired IgA class switching in APRIL-deficient mice. Proc Natl Acad Sci USA 2004; 101: 3903–3908. Intestinal bacteria trigger T cell-independent immunoglobulin A2 class switching by inducing epithelial-cell secretion of the cytokine APRIL. Immunity 2007; 26: 812–826. TACI and BAFF-R mediate isotype switching in B cells. J Exp Med 2005; 201: 35–39. DCs induce CD40-independent immunoglobulin class switching through BLyS and APRIL. Nat Immunol 2002; 3: 822–829. A primitive T cell-independent mechanism of intestinal mucosal IgA responses to commensal bacteria. Science 2000; 288: 2222–2226. Airway epithelial repair, regeneration, and remodeling after injury in chronic obstructive pulmonary disease. Proc Am Thorac Soc 2006; 3: 726–733. Microarray analysis of human leucocyte subsets: the advantages of positive selection and rapid purification. BMC Genomics 2007; 8: 64. Human dendritic cells transfected with allergen-DNA stimulate specific immunoglobulin G4 but not specific immunoglobulin E production of autologous B cells from atopic individuals in vitro. Immunology 2007; 122: 239–246. Purification and NH2-terminal amino acid sequence of a T-cell-derived lymphokine with growth factor activity for B-cell hybridomas. Proc Natl Acad Sci USA 1986; 83: 9679–9683. Regulation of mucosal IgA responses: lessons from primary immunodeficiencies. Ann NY Acad Sci 2011; 1238: 132–144. Airway epithelial cells produce B cell-activating factor of TNF family by an IFN-β-dependent mechanism. J Immunol 2006; 177: 7164–7172. TACI, unlike BAFF-R, is solely activated by oligomeric BAFF and APRIL to support survival of activated B cells and plasmablasts. Blood 2008; 111: 1004–1012.
. TACI, an enigmatic BAFF/APRIL receptor, with new unappreciated biochemical and biological properties. Cytokine Growth Factor Rev 2008; 19: 263–276. A novel insight into adaptive immunity in chronic obstructive pulmonary disease: B cell activating factor belonging to the tumor necrosis factor family. Am J Respir Crit Care Med 2010; 182: 1011–1019. High levels of interleukin-6 in the exhaled breath condensate of patients with COPD. Respir Med 2003; 97: 1299–1302. Interleukins and IgA synthesis. Human and murine interleukin 6 induce high rate IgA secretion in IgA-committed B cells. J Exp Med 1989; 169: 2133–2148. CD11b+ Peyer's patch dendritic cells secrete IL-6 and induce IgA secretion from naive B cells. J Immunol 2003; 171: 3684–3690. Interleukin-6 contributes to inflammation and remodeling in a model of adenosine mediated lung injury. PLoS One 2011; 6: e22667. Associations of IL6 polymorphisms with lung function decline and COPD. Thorax 2009; 64: 698–704. Persistent systemic inflammation is associated with poor clinical outcomes in COPD: a novel phenotype. PLoS One 2012; 7: e37483. Three-year follow-up of Interleukin 6 and C-reactive protein in chronic obstructive pulmonary disease. Respir Res 2013; 14: 24.
van Geffen WH, et al. Differential switching to IgG and IgA in active smoking COPD patients and healthy controls. Eur Respir J 2012; 40: 313–321.
. Immune and inflammatory function in cigarette smokers. Thorax 1987; 42: 241–249. Bacteria challenge in smoke-exposed mice exacerbates inflammation and skews the inflammatory profile. Am J Respir Crit Care Med 2009; 179: 666–675.